This past weekend I found myself away from home and toothbrush-less. Of course, I did what anyone would do: I didn’t brush my teeth for two days. By the time Sunday rolled around though, my mouth taste like Coors Light and Taco Bell (it doesn’t matter what exactly, their menu’s all the same anyway) and I couldn’t ignore it any longer. I headed toward the closest superstore, in this case Hyvee, and scouted out the aptly named ‘Mouth Care’ isle. I’d already decided that not even the presence of an onlooking Megan Fox would make me splurge on anything but the cheapest toothbrush, so it was with little fanfare that I decided to go with the Hyvee Gem Grip Firm Toothbrush. At $.97 it was the cheapest one around by only about $.20, which prompted me to wonder; Why the Hell did Hyvee decide enter the off-brand toothbrush market? People buy cigarettes and cereal way more often than toothbrushes, and yet I don’t see Hyvee Filtered Lights near the checkout isle? Whatever their angle is, it worked. I bought one. How many expectations can you have for a toothbrush? Two? It’s got to have bristles and be long enough to reach the back of your mouth, and that’s about it. 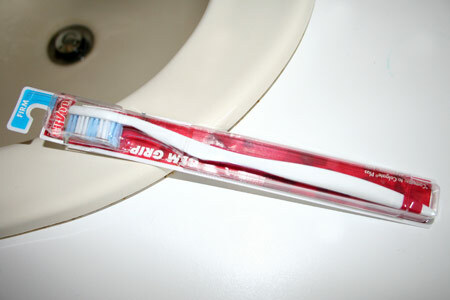 In that sense, this is an excellent toothbrush. On the other hand, I quickly realized that I’ve been spoiled by the (always blue) Colgate toothbrush I get from dentist every 6-8 months. It may sound strange, but the angles on this things felt very weird in and around my mouth. The handle was thicker than it needed to be, combined with the very rectangular cross section, made it difficult for me to get my lips around it as I struggled to keep a frothy combination of toothpaste and saliva in my mouth for the whole requisite minute my dentist recommends I brush for. This certainly isn’t an everyday toothbrush to keep in your bathroom. For one, it’s not ADA approved, and sitting by your sink in all its boringly white glory, it’s not going to impress the ladies that are into those sorts of things. This toothbrush is the kind you buy when you need a quick brushing, then stash it away in your glove box to use the next time you detail the air conditioning vents in your Prius.